I looked at the wind forecast, and things didn’t look good, but fortunately there wasn’t a breeze stirring when I woke up. I’ve had some problems with the lights on my boat trailer, but somehow they were working fine as I pulled out of my driveway and headed down Route 50. I’d overslept a little and I don’t like being late, so I decided not to stop for gas. When I got to the ramp, the gas gauge was pegged way past full. “You still driving that old F-150?” he asked. “In that case, I bless you with a special parking place in the Chesapeake Bay Foundation gravel lot,” he replied. “That’s not that big of a deal,” I thought, but I kept it to myself as I pulled around to launch the boat. There were a couple of other trucks already at the ramp and, as usual, the guys had their headlights on so I couldn’t see behind me. Miraculously, they cut their lights just as I started backing up. 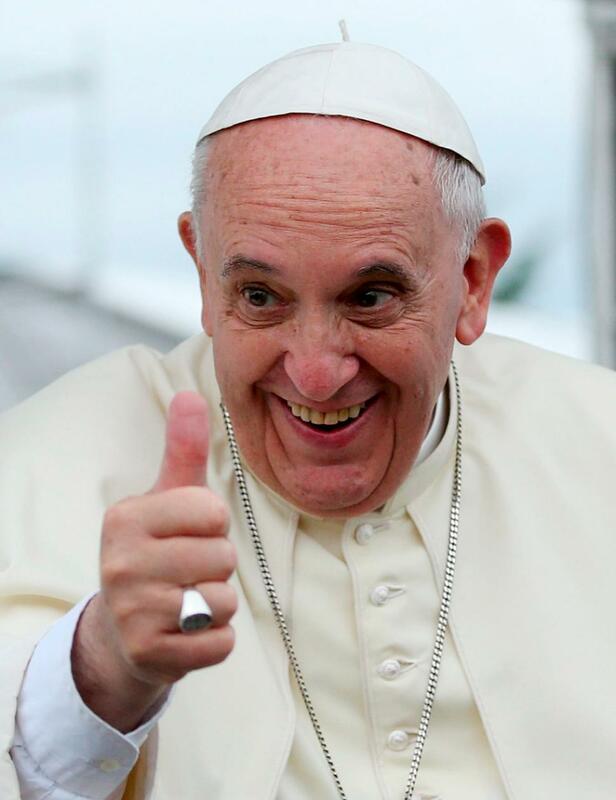 When we got in the boat, I asked the Pontiff why he didn’t bring any rods. He said he was okay with using mine. I felt a little embarrassed because my reels were rusty and I haven’t changed my braid in awhile, but when I looked down at my outfits, they were freshly oiled and all the line looked new. “You okay with a baitcaster?” I asked. He just looked at me with a familiar you-don’t-really-think-the-Pope-would-use-a-spinning-reel kind of way, so I pointed my boat in the direction of Eastern Bay. “Are we chasing birds or working the ledges?” he asked. As we passed The Jetty dock bar on the way out, the Pope told me stories about when he worked there as a bouncer. That reminded me that I have a few confessions to make, but he asked me to save them for later. Surprisingly, all my electronics worked, so I turned on the boat stereo. I wanted to listen to The Von Trapp family but he suggested Black Sabbath. We head-banged all the way to Poplar Island and the trip seemed a lot quicker than usual. I lined the boat up on one of my favorite points and tied on a popper, but the Pope wanted to use a spook. I felt a little awkward when I hooked up on the first cast, but my fish came unpinned just as the Pope had a massive blow up. I was worried he would set the hook too early, but his timing was impeccable. “Expecta pondus,” I heard him mutter. My Latin isn’t that good but I think that means wait for the weight. It was a nice fish, easily 30 inches. I offered to help him land it, but he lipped it and pulled it in by himself. “You got a cooler?” he asked. “Wait a minute, I always took you for a catch and release guy,” I shot back. I thought we were coming up on slack tide, but miraculously, the current kept moving. The Pope hooked up again and again, but I couldn’t buy a fish. “You sure have the hot hand,” I said. He told me to try casting on the other side and I hooked up right away. A couple of charter captains trolled by. 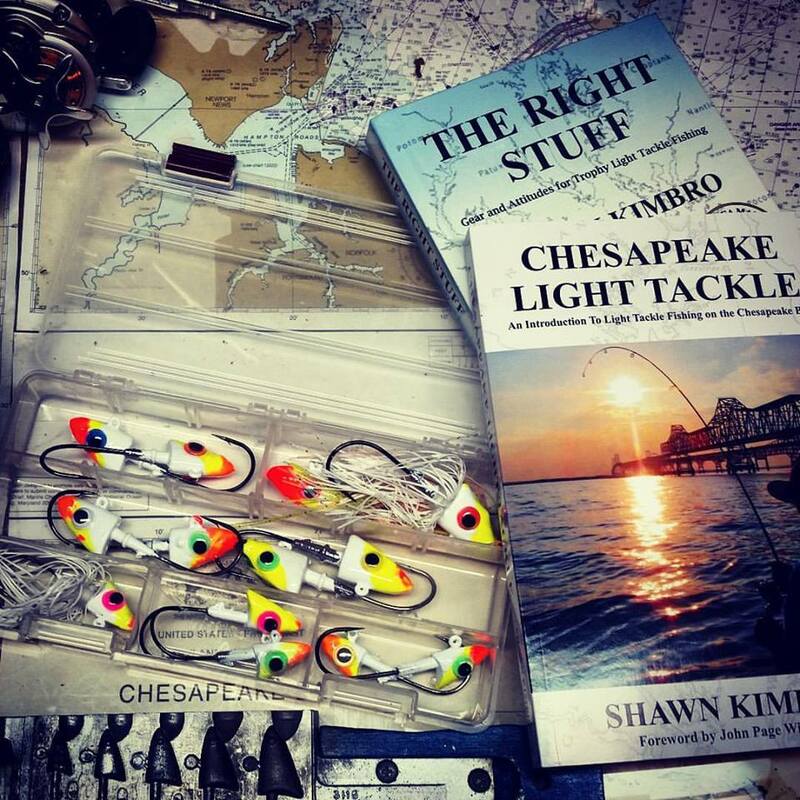 They waved at us with glowing smiles that showed us how much they respect and appreciate light tackle fishing. It was time for lunch so we ran into Knapps Narrows and stopped at one of the dock bars on Tilghman Island. I got a cheeseburger and the Pope ordered soft crabs and a Caprese salad. There were some watermen there who told us how much they appreciate all the oyster sanctuaries in the Chesapeake Bay. Afterwards, we headed back out toward the main channel. I wanted to offer the Pope a beer, but when I looked in the K2 cooler, all I had was water. 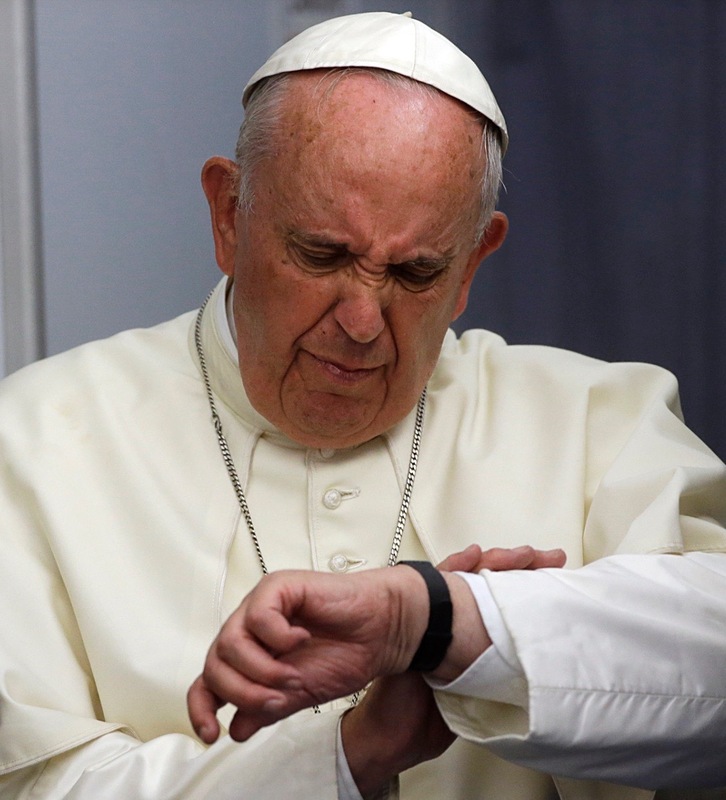 I apologized but the Pope said, “Look again.” When, I did, there was a six-pack of Brewer’s Art Resurrection and a case of Peroni. By mid-afternoon we were back at the ramp. I looked at my gas gauge and it still read full. “Does that thing work?” he asked. I offered to clean his two fish but when I opened the cooler, they were already filleted. I told him the Natural Resource Police doesn’t allow cleaning fish on the water, but he said he was tight with the governor, so it would be okay. 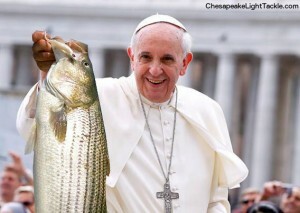 I thanked the Pope for a fun day of fishing. He said he had to hurry because he had to speak to the sick and mentally ill at the Capitol. I asked him what he thought of John Bohner and he said he thought the next speaker would pale in comparison. I asked him if he’d stop by DNR in Annapolis and ask them to give rockfish and wild oysters a break. He said some things are impossible even for the Pope. He suggested that next time we go in kayaks. I said it would be okay, but it meant a lot of paddling. “Yeah, I guess you’re right,” he replied. “But you should at least consider moving up to a 300 horse-power motor for better fuel economy.” I thanked him for the advice and walked back to my truck. I noticed my trailer tires had a lot more tread on them than before and it looked like some Good Samaritan had replaced my wheel bearings. Just because Jamie wears white after Labor Day doesn’t mean he is the pope. I would love to know what the full tank of fuel trick is though. Oh, and the 300hp, make it a Verado. 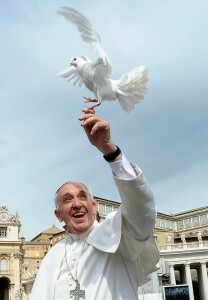 Coach Jenkins and the Pope should go fishing sometimes. I was believing this story until the 24th paragraph, with the bit about the Charter captains smiling and waving at light tackle fisherman. Nothing like a good read to start the day off! Any way I could get a copy of the Pope with this fish! I LOVE it. Thanks so much.